OK, so you may be thinking to yourself, “Dude, what gives with all the Icelandic band posts lately?” Fair question. Truth is we’re headed back to Reykjavik shortly for a quick five day visit, and I’m excited as hell about the thought of all the record shopping I’m going to do while Holly and her mom are out looking at shoes. My friends at Lucky Records already have a half dozen albums on hold for me, and I can’t wait to dig through the selection at their new, bigger location. 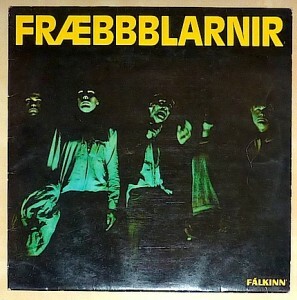 Fræbbblarnir was on my want list last year, and I was surprised to run across this album at the local flea market. Before you get too excited for me about my rare flea market find, trust me when I tell you that this guy knew exactly what he had and I paid accordingly. It was actually a great score for me – I got this, Rokk Í Reykjavík, and the Tappi Tikarrass album Miranda, three heavyweight Icelandic vinyl classics, so don’t cry for me Argentina. My copy has a lot of pops and clicks, but hey, it’s vinyl. And it isn’t available on CD. Poppþéttar Melódíur Í Rokkréttu Samhengi is that wacky style of Icelandic punk as it moved towards new wave. Released in 1982, it still has that punk pacing, some driving guitars, and some of the very stilted sounding punk vocals, but there are some synth sounds and effect pedals being used as well. It’s sort of how the Ramones might have sounded if they had been heavily influenced by Devo. A surprising number of the songs are in English – seven of the 15 tracks. Obviously I don’t know much about the Icelandic lyrics, but some of the English stuff is odd to say the least. and nothing can disturb his work. Climbing up on Korski’s couch was pretty tough for dwarfs. Those who made it felt no pain as bullets broke their skulls. The others fell down to be crushed. OK, so songs apparently about killing dwarfs aside, much of the rest of the English language lyrics are more or less standard early punk fare. The album has a lot of energy, carrying a frenetic pace through a lot of the songs. If you’re a fan of post-punk and early new wave, you’ll probably dig the sound. This entry was posted in Iceland, New Wave, Post-Punk and tagged Falkinn, Fraebbblarnir, Icelandic Music, Music, New Wave, Post Punk by Administrator. Bookmark the permalink.